A Fred Shero quotation: I’m like a duck: calm above the water, and paddling like hell underneath. 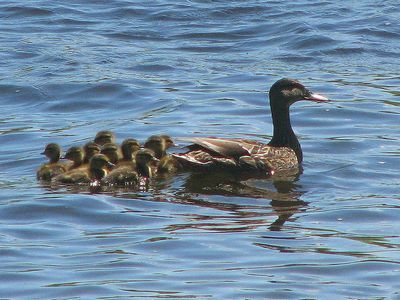 The American Black Duck (Anas rubripes) is a large dabbling duck. The behaviour and voice are the same as for Mallard Drake. Their breeding habitat is lakes, ponds, rivers, marshes and other aquatic environments in eastern Canada and the Adirondacks in the U.S. Female, immature and eclipse male Mallards are much paler, with no contrast between head and body. Hybrid Mallard Black Ducks are often seen and usually have traces of the mallard plumage, with bluer speculum usually bordered with white on one or both edges. Mottled Duck is similar. This species is partially migratory and many winter in the east-central United States. These birds mainly eat plants, but also some mollusks and aquatic insects. The Black Duck has long been valued as a game bird, being fast on the wing. Bird Quote Notice Please submit bird quotes, or your own bird quote. Enter the bird quote for others to enjoy by filling out the Submit form on the menu. behave like a duck, Duck, Fred Shero, Jacob Braude. Bookmark.